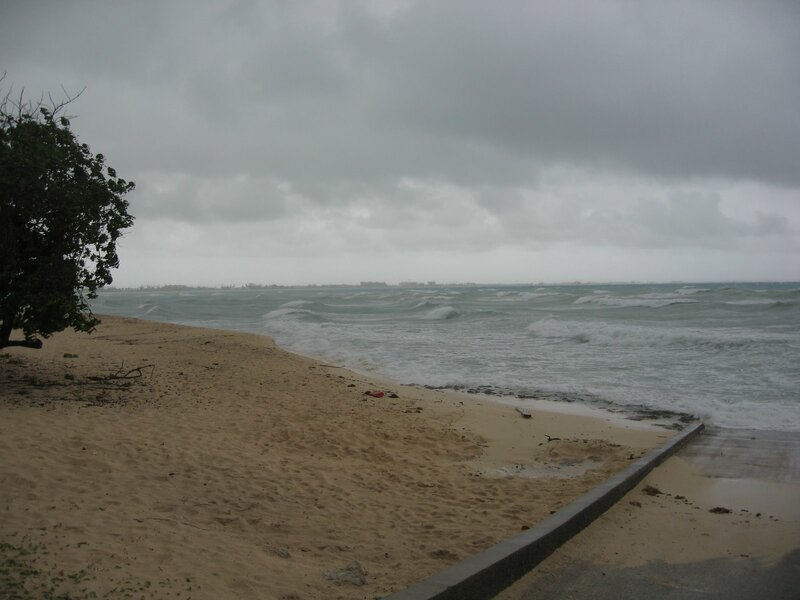 Grand Cayman made it through Gustav OK. Cayman Brac and Little Cayman got really whacked. He passed between the islands and the ones on Gustavs right side got it bad, and the one on his left got lucky. 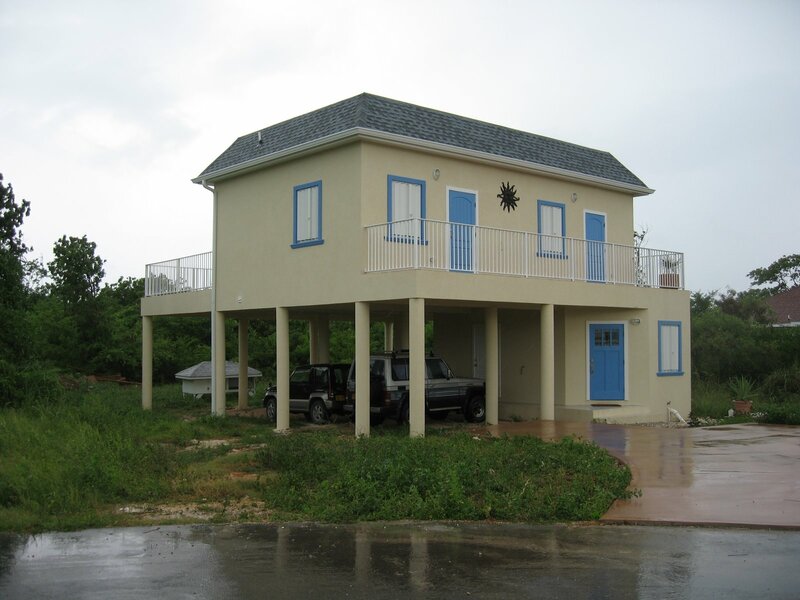 I personally had no damage, I designed my house to be a hurricane bunker. I have 10 foot tall 12 inch thick concrete stilts. I have a concrete slab with 2 foot thick concrete crossmembers. My walls are 8 inch block, with every hole filled with concrete with steel in every other hole. My roof is flat concrete, 8 inches thick on the edges and 7 in the center. 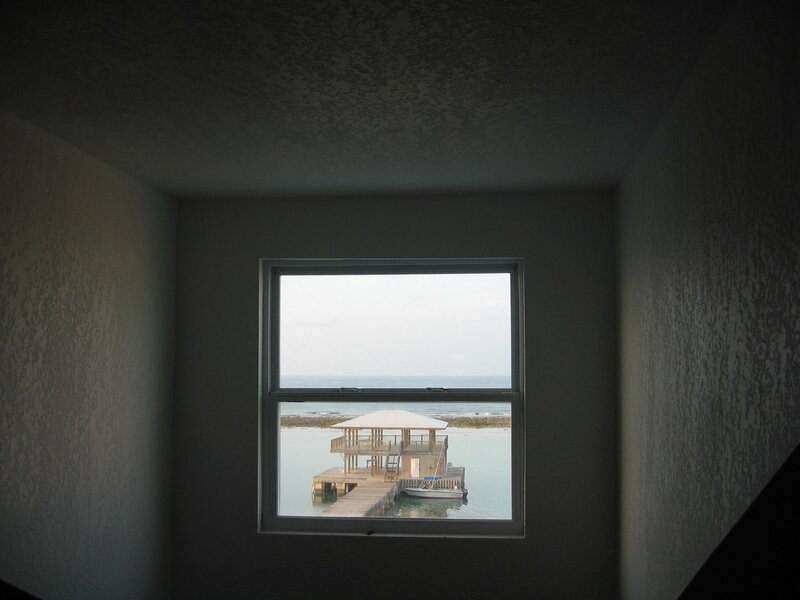 (for drainage) I have good, accordion style hurricane shutters on my windows and plywood cut and ready for the windows in the doors. I lost almost everything in Hurricane Michelle and got flooded by Ivan and I was still scared as Gustav approached. All of a sudden, this looks much worse than before. Sheba was incredibly well behaved yesterday and last night! I was awed. No accidents, no blatant acts of rebellion. Maybe something clicked for her! She spent the night before last and the night before that outside. Last night she stayed in and had a perfect performance record! Wow! 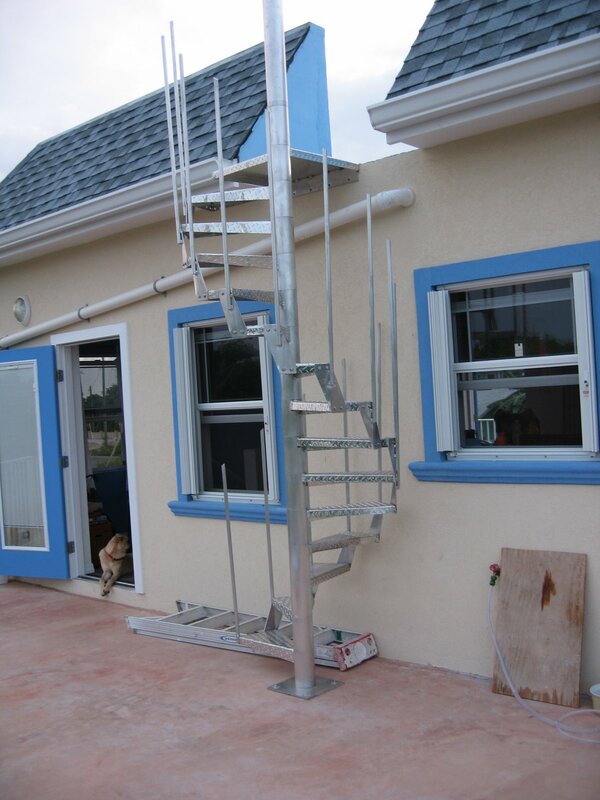 Here’s a picture of my new aluminum spiral staircase, they started installing it in yesterday and hopefully they’ll finish today! It’s all shiny and beautiful! And it takes less room that the ladder that was there before. It really turned a lot better than I expected. All that’s left to do is put the armrail on it! It was custom built by Caribbean Engineering (Phone 345 946 5000). Apparently they don’t have a website. The storm is still coming. I have a new transmitter in Customs, the old one failed and I’m running on backup. We don’t want to order the parts for the old one, so I’m going to try to get the ne one out of customs and installed today It may be an impossibly big job. Wish me luck! 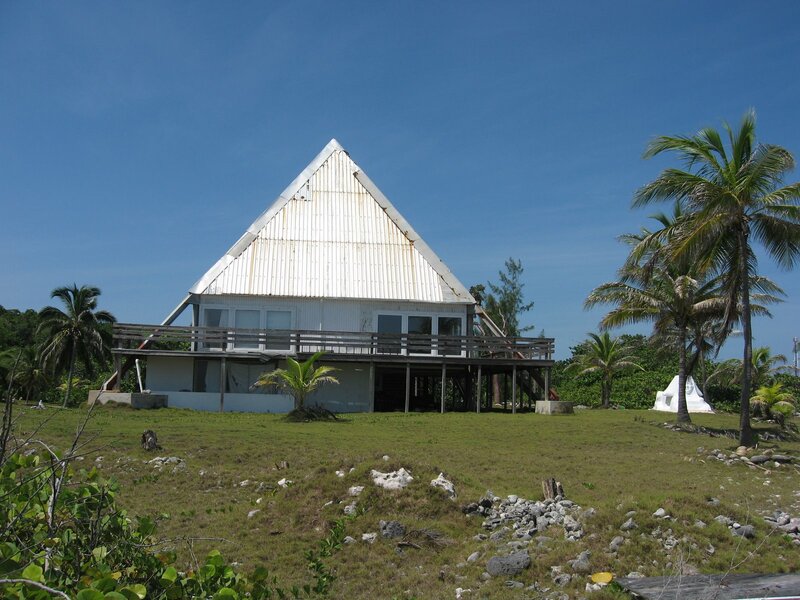 Here comes one, the track is more southerly than yesterday, if it swings any more south. . . .
Heres a couple of pics I took on Cayman Brac of a pretty cool looking house, except it looked like it needed a little work. There’s a postcard available of this house! I am very disappointed by the NBC coverage of the Olympics. For the most part, they are showing only the Americans and not showing the other countries. I saw them fooling around for a half hour, the announcers playing badmittion with two members of the US Olympic Badmitton team. A lot of time, they don’t even show the judges score of the other countries athletes. They were interviewing someone who came in 8th place this morning. I wish we had a decent BBC feed covering the games. This is the view from my room on Cayman Brac. This is as close as I can get to the window, because there’s a balcony. 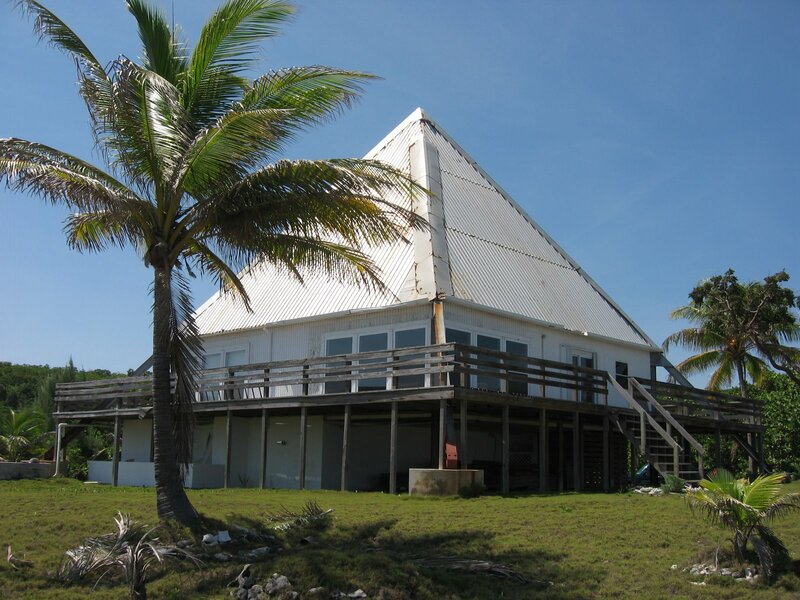 I arrived on Cayman Brac Sunday, and I”ll be here till next Saturday. I’m here to work on my transmitters and also for the Dept of Youth and Sports Radio Camp. I’ve been very busy and I’m having a lot of fun. I’ve always had a problem dealing with anger. These past few days have been really bad. I wake up the next morning and feel like a different person than when I went to bed. I wish I could quit getting angry like I quit drinking.